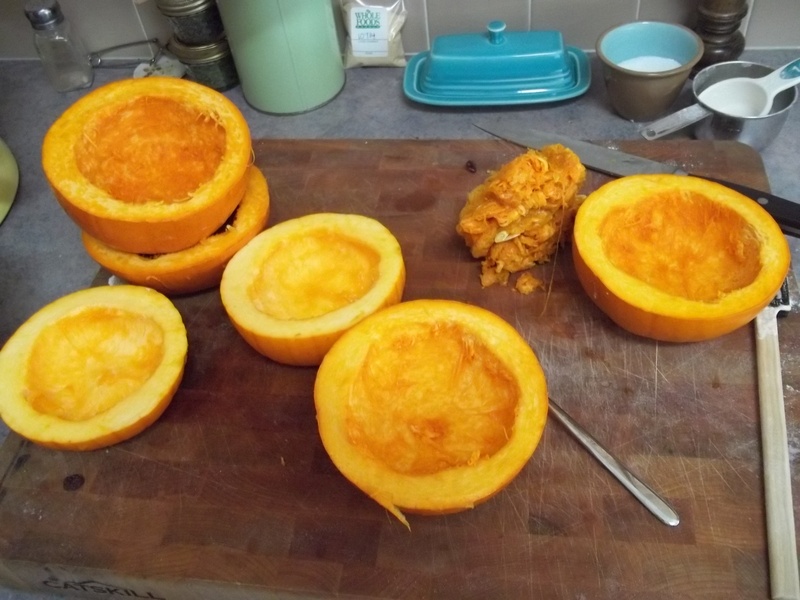 Thanks Robert for that update on the storage potential of winter squash. Now I bet you want to know how to cook them. I personally like to roast them and make pumpkin pie healthy food for my family. Here’s how I roast them. It’s pretty easy and requires no monitoring, so you can go about your other chores. 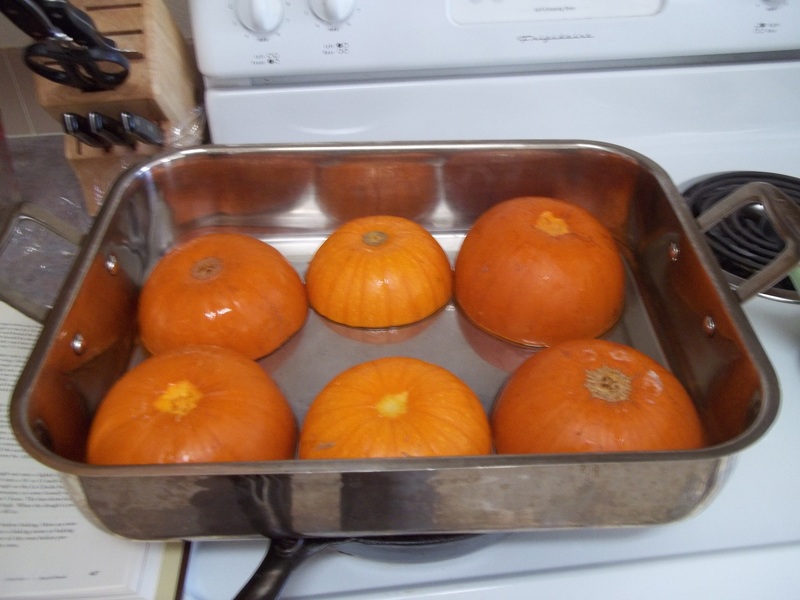 You can roast pumpkins or any winter squash this way. First, preheat oven to 350°F. Now, cut them in half. Be careful, they can be very hard, which makes cutting a little dangerous. Now pop them in a roasting pan, cut side down, like so. And finally add some water to the bottom of the pan, maybe a cup or less. It depends on the size of the pan and how many you are roasting. Mine has a groove along the outer edge so I like to add a little more because I know the pumpkins won’t be sitting in the water. Cover with aluminum foil tightly and roast for 45 minutes to 1 1/2 hours. Until they are tender when you push them with your finger. 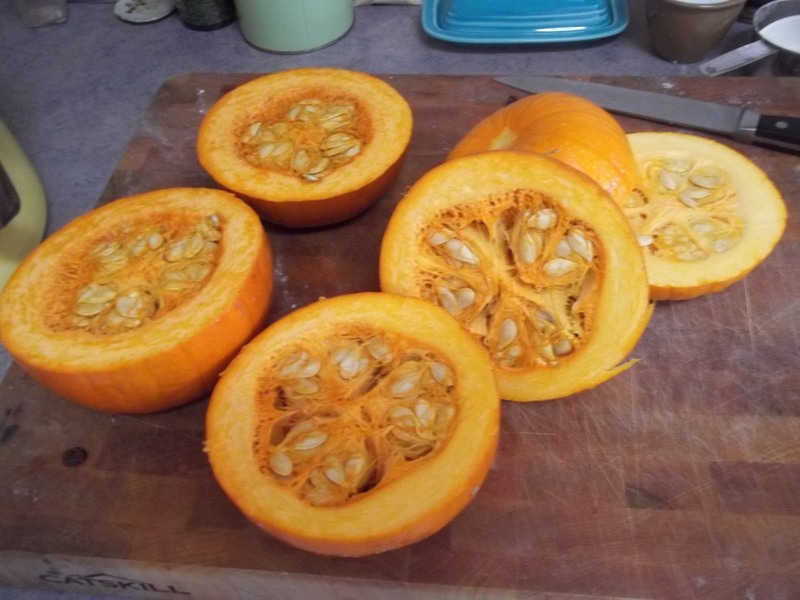 If they aren’t done, it makes them tougher to scoop out and the pulp is often more stringy and fibrous. 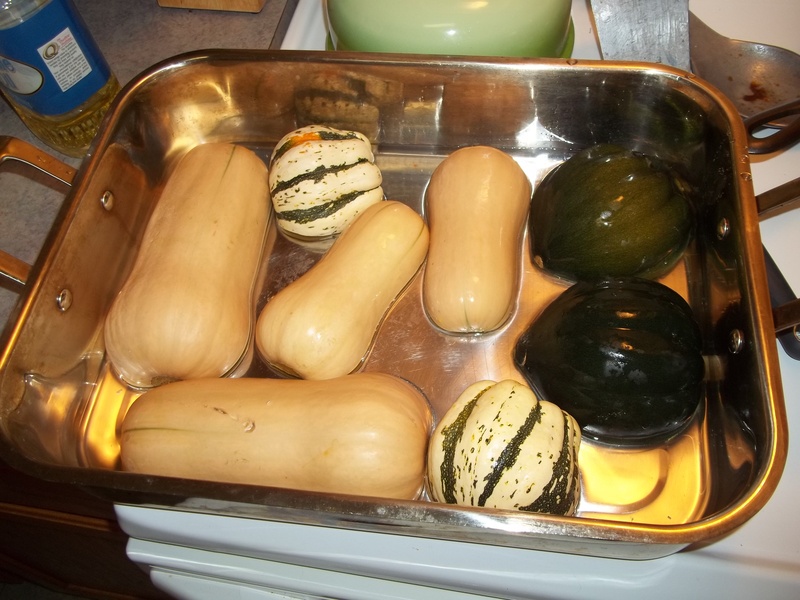 Here is butternut squash, acorn squash and sweet dumplings. Here’s a link to a really yummy Thai coconut curry soup from Weight Watcher’s that uses butternut squash but I think you could substitute any winter squash. 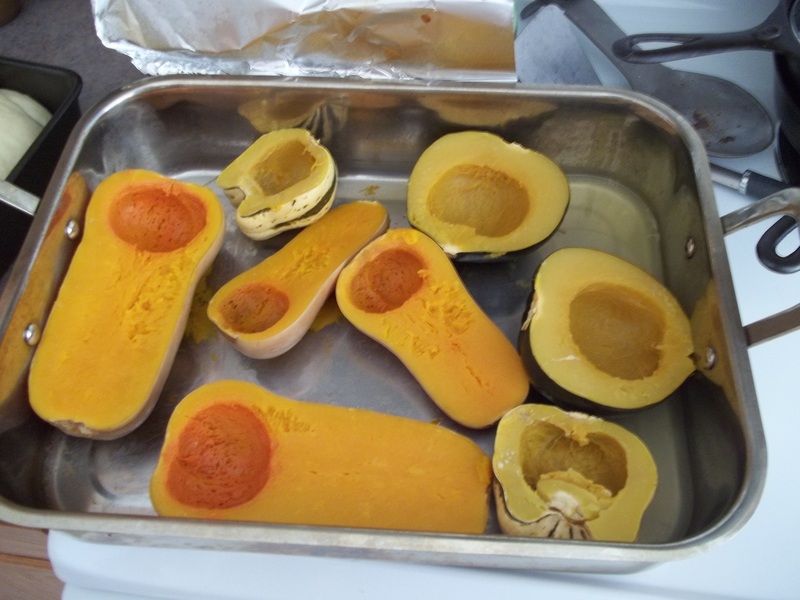 Please share a link to your favorite squash recipes in the comments section. Okay, if that title is not enough to get you interested then let me tell you that these cookies are to die for. You will love these if you often find yourself disappointed that Reese’s peanut butter cups are not as good as you think they should be, Baskin Robbins Peanut Butter Chocolate ice cream is not as intense as you would like, or you find yourself eating peanut butter on a spoon studded with chocolate chips. Okay, if this is you then read on, make these cookies and hide them from your family. This recipe was very kindly shared with me by a friend. She gave her sister the credit for coming up with them, isn’t that sweet. Mix the first 5 ingredients then add remaining ingredients. Drop by big spoonfuls or with your handy dandy cookie scoop. Bake at 350°F for 10 -12 minutes. This is a high altitude recipe, you may have to add double the baking soda at sea level. My friend says you can easily omit the flour and they are wheat free cookies – not bad. Or you can add wheat flour to add even more fiber than the 4 cups of oats are giving you. Think of these cookies as healthy and good for you. I do. I love cranberries. Fresh or dried, I love them. 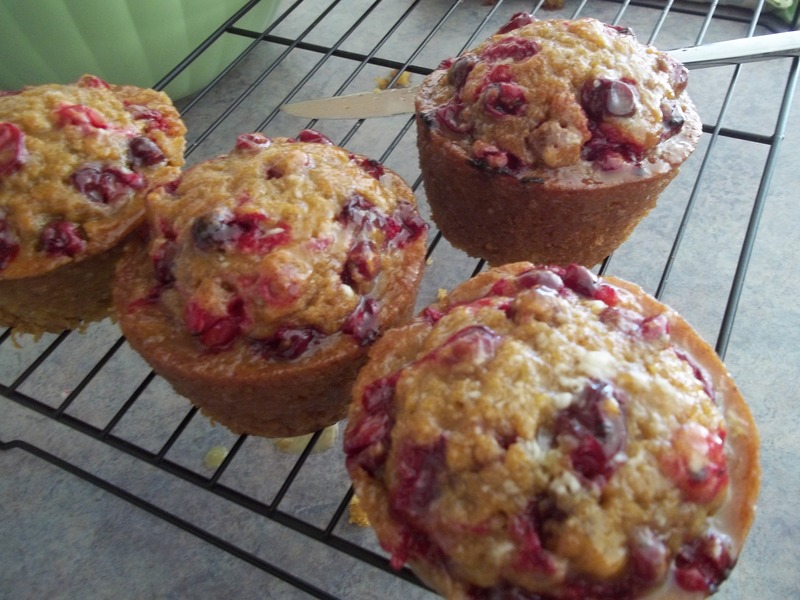 But I really love biting into a muffin or scone and tasting a fresh, juicy, tart cranberry. 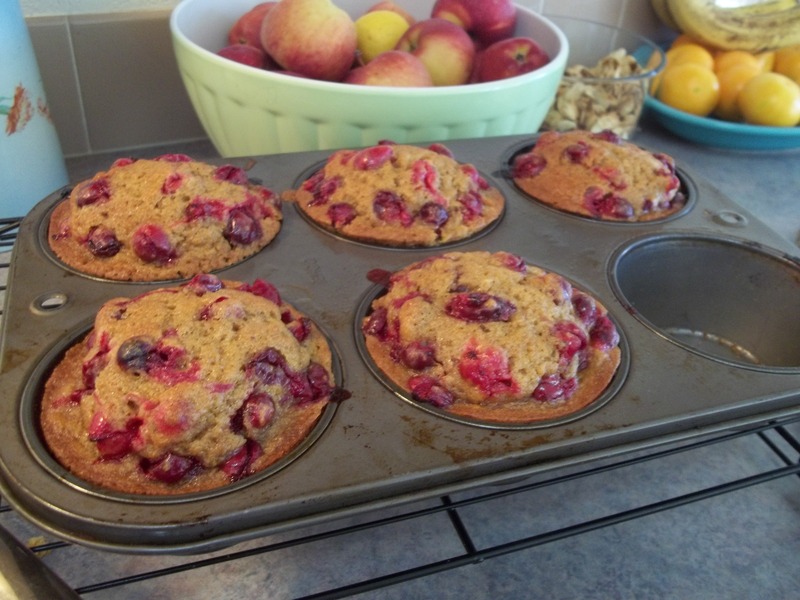 So began my thought process as I created these yummy pumpkin cranberry muffins. I started with my grandmother’s pumpkin bread recipe which is far and away the best pumpkin bread you will ever try. Very moist and not overly spicey. Why add pumpkins you ask? Because it’s January and I still about 20 pie pumpkins in my kitchen. 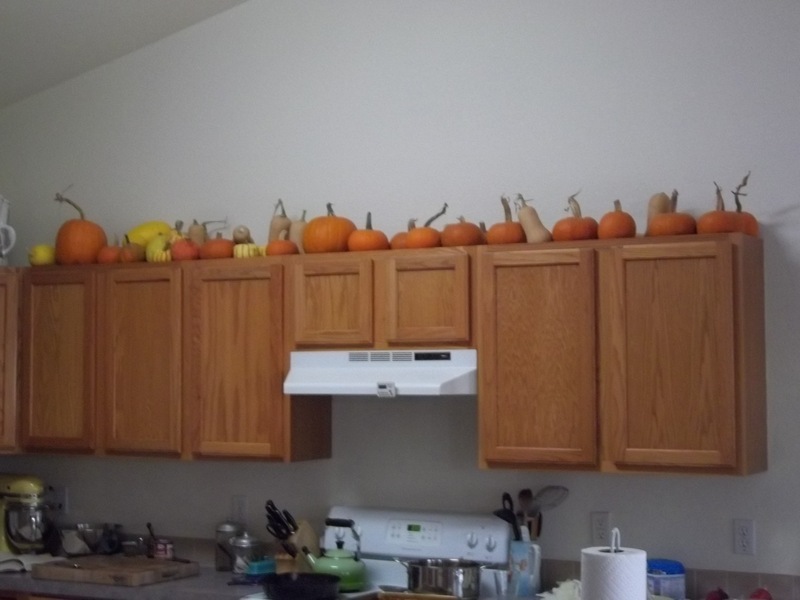 People walk in and say “whoa that’s a lot of pumpkins.” Yes, we are horders and we love free things. So when our CSA said free pumpkins come and get them before the frost, we dropped everything and loaded up our minivan. So long story short I put pumpkin in everything now-a-days. Even my son who has an itty bitty vocabulary saw a picture of a pumpkin and said “cook and eat”. Most kids would have wanted to carve a jack-o-lantern it but not my 2 year old. This recipe can accommodate pretty much any shape pan that you have. I used the giant muffin tins 50 minutes), stoneware mini loaf pans (55 minutes), loaf pans (1 1/2 hours), mini muffin tins, you name it. To make this at a high altitude use half the leavening agents called for in the recipe below. 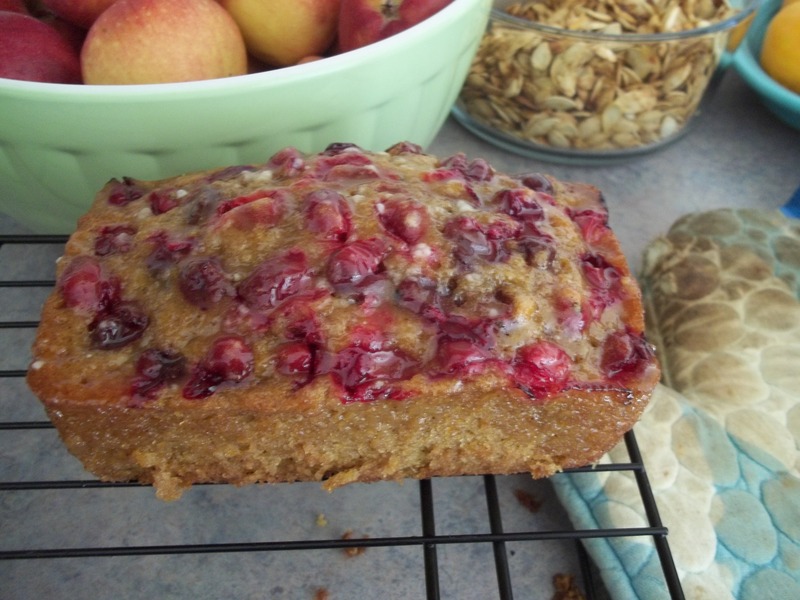 I am going to give you the base pumpkin bread recipe and then you can add in whatever you like. Mix all dry ingredients together. Mix all wet ingredients together. Add wet to dry and fold in Add-ins. Bake in greased pan @ 325°F for time mentioned above. Let cool briefly in pan and then use knife to loosen sides and invert on cooling rack. If you are glazing the loaves you can do it in the pan or on the rack. More will absorb into the bread if you do it in the pan. To make the glaze whisk together the orange juice and water and then add lots of powdered sugar until it is nice and sweet. It may take a cup or two of powdered sugar. Cool completely. These can be wrapped in plastic wrap then foil and make great gifts. This is really nothing special but just a simple, yummy, fall salad. Stir well, pour on salad and toss, serve. The amounts of everything are really just approximates. I like to use equal parts lemon juice and olive oil because I like it tart and not oily. Play with the recipe until it suits your taste.